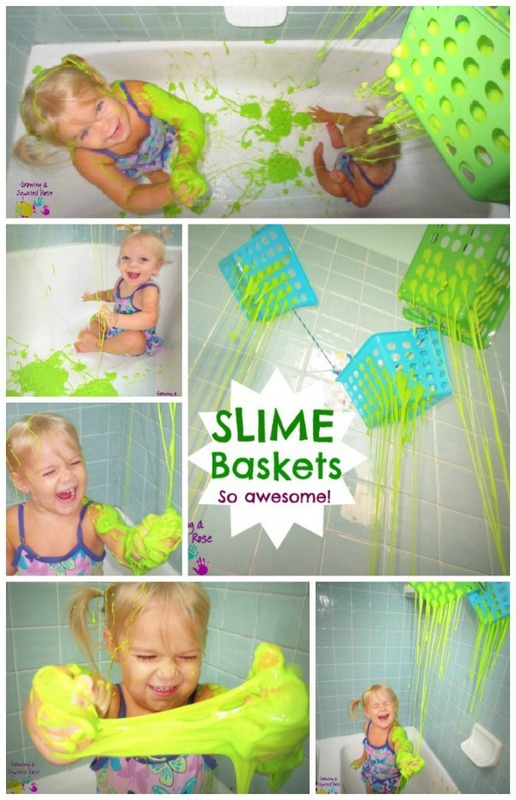 When I first saw Flubber Slime Baskets over on Juggling with Kids, I knew it was a must do activity! Our outdoor space is very limited so I immediately began trying to think of ways that we could set this activity up in the bath! It was actually very easy. 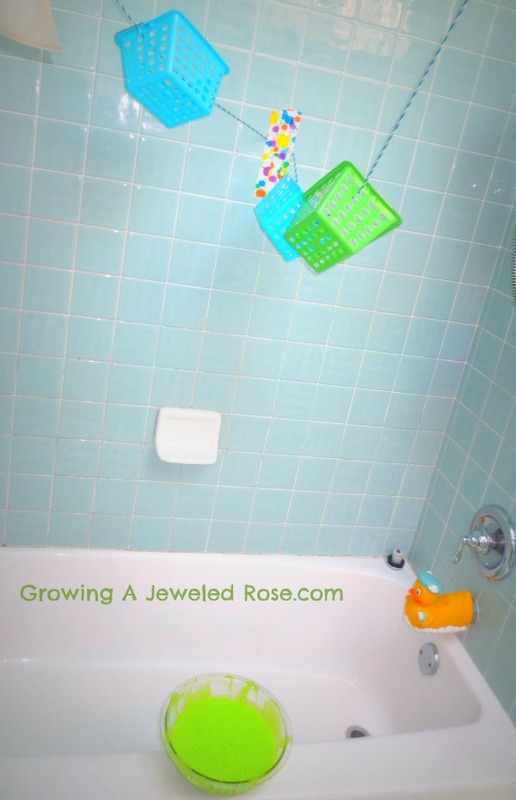 I used utility rope I purchased from The Dollar Tree to hang three baskets (also purchased from The Dollar Tree) The rope was tied to the shower curtain rod and then secured to the bath wall with duct tape. The duct tape was more then strong enough to hold the rope in place. 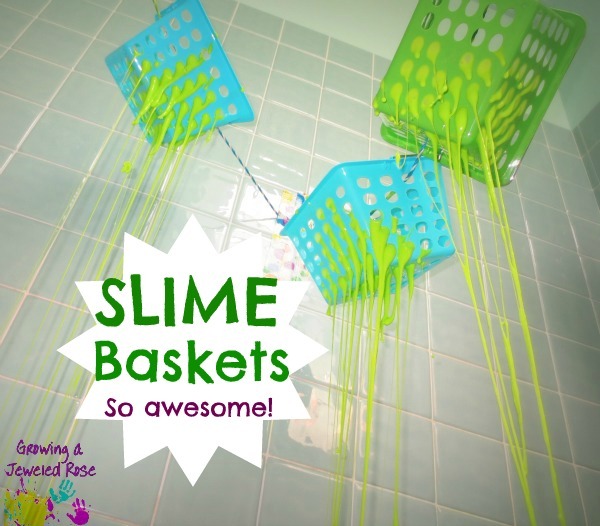 I had the slime waiting and ready to be put in the baskets just as soon as the girls were under them. Mix the contents of both bowls well. Once mixed combine both bowls together and mix for several minutes until the desired consistency is reached. This tweaked recipe gave us the perfect consistency! If yours turns out a little too thick it means you added too much borax. 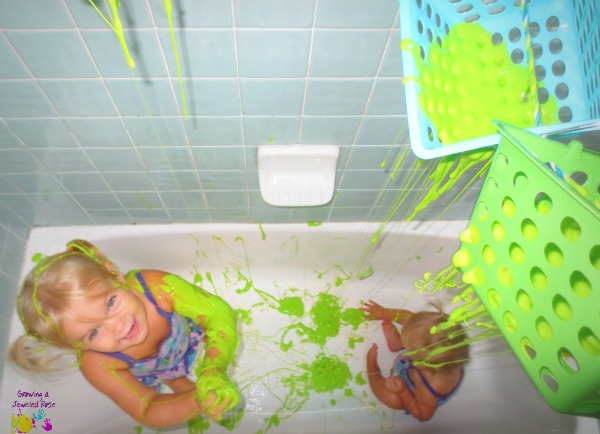 Once the girls were in the tub, I filled the baskets with the slime! It came pouring down very quickly! Both girls loved this activity! I mean, what kid wouldn't? 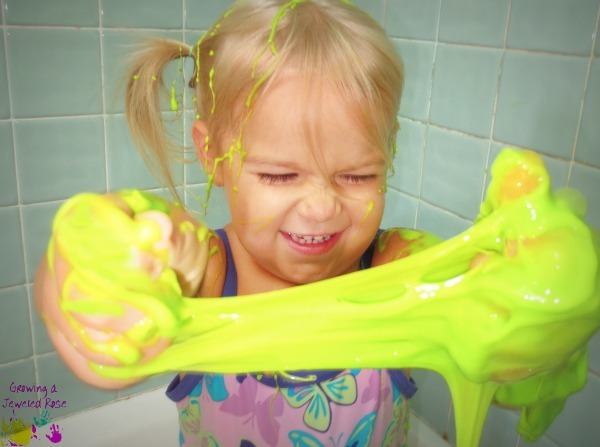 Even I wanted to play in the slimey goodness! 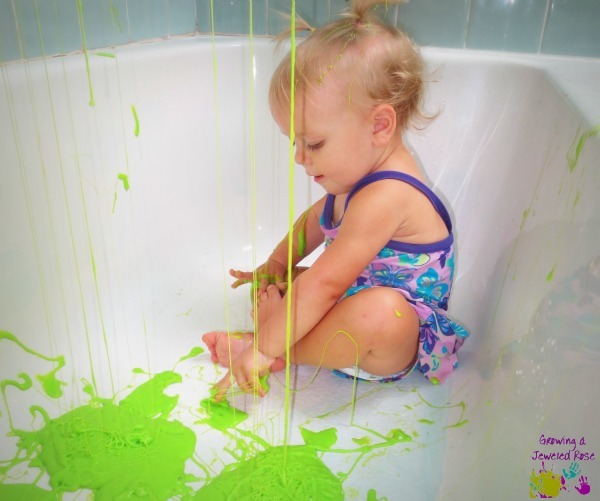 And the best part about doing this activity in the bath was that all the mess was contained, and all surfaces easily wiped clean! 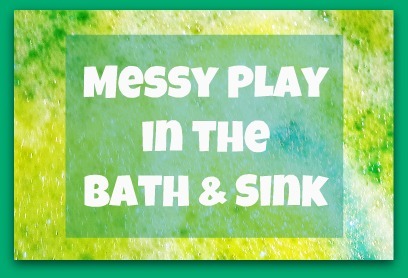 To clean the bath surfaces, I took one piece of slime and used it to pick up all the other pieces. The slime sticks to itself, and easily came right off of all surfaces. Once I had gathered the majority of the slime, I placed it in a ziplock bag for us to play with another day. 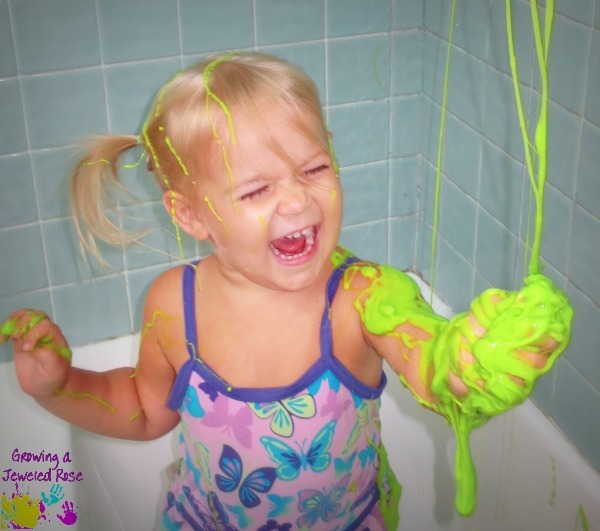 Then I turned the shower on for the girls, and helped them get all the slime off of their skin and out of their hair. I was a little worried about the slime getting stuck in their hair, but it came out pretty easily. 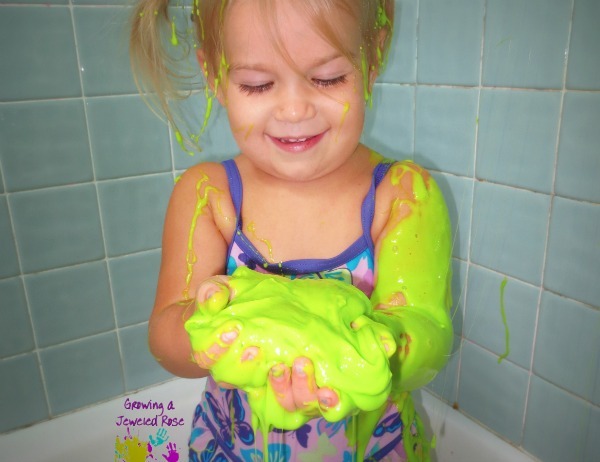 Once the girls hair was wet, I just had to rub their heads where the slime was to get it out. 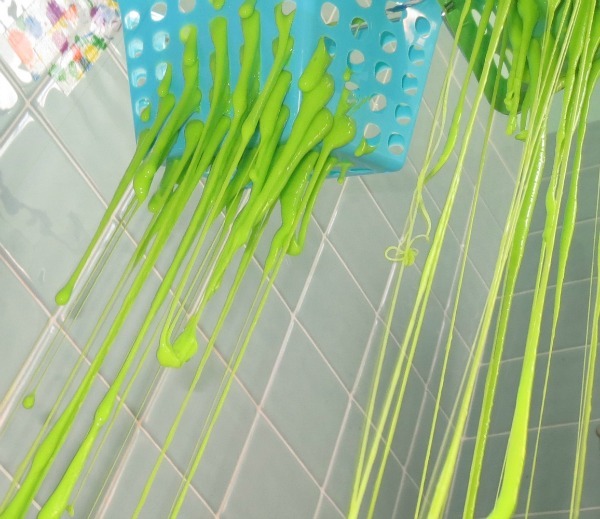 Any and all SLIME remnants were washed away by the time the shower was over. Oh yes, we will definitely be doing this one again my friends! 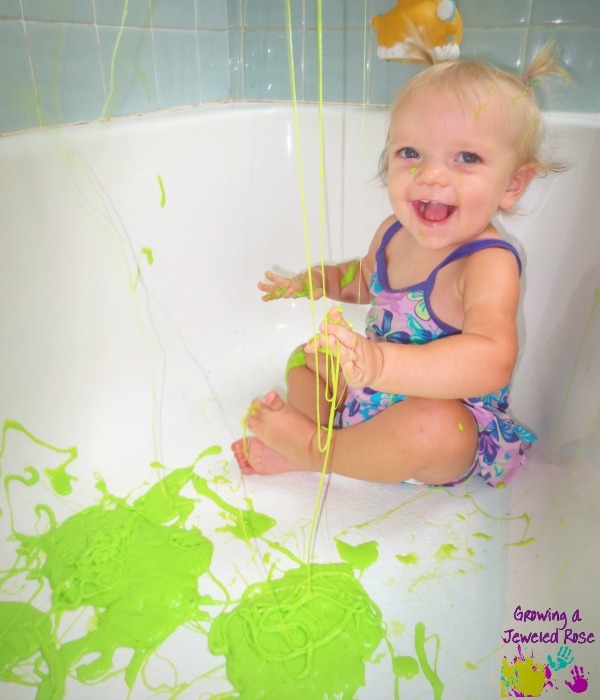 Don't forget to pop over to The Golden Gleam to see how she played with slime in the sink! Did you know that we have a sister site? Sisters in Play, Learning, & FUN!